Yes we do! In fact, we have several options available to you. When you first get your estimate, feel free to ask one of our representatives about it. We’ll help you explore your options and move forward with confidence. Is it really worth it to upgrade to a higher quality shingle? It may seem like a big investment, but purchasing high-quality shingles pays off. Most of all, high-quality shingles gives you long-term protection. At the end of the day, investing in higher quality shingles will help you avoid a full roof replacement, which can be quite costly. Roof replacements mean that you pay for roofing specialists to remove old shingles, dispose of them, and install the new shingles with any additional accessories. To upgrade your shingles, you only pay for the difference in cost of materials – nothing else. And you’ll receive a much better warranty, too! Black streaks are usually a result of algae growth on north facing slopes or shaded areas. Don’t worry – there are ways to lessen the growth. Typically, we install a shingle with stain-resistant properties. We can also install zinc strips at the ridge of the roof to help prohibit algae growth. Why are the shingles more deteriorated under my antenna than anywhere else? When rainwater comes in contact with exposed aluminum, it creates an acid that damages the shingle’s protective asphalt coating. Over time, this acid will cause the shingle to blister. Blistering exposes the core of the shingle, leaving it vulnerable to premature failure. We always recommend taking down unused antennas, which is a service we provide. Why haven’t my shingles lasted very long? Sometimes, shingles experience premature failure. There are a few reasons for this. Often, it’s the result of poor ventilation in the attic. Excessive heat buildup in an attic causes the oils in the shingle to dry out, limiting air flow. Shingles may also fail prematurely because of a manufacturing defect or improper installation. There is shingle granule in my eavestrough. Are they defective? You may notice some granule loss after installing new shingles, which then builds up in your eavestrough. This is normal. The loose granule on the surface of the shingle is leftover from the manufacturing process. If the shingles are older and losing a lot of granule, they are nearing the end of their lifespan. That’s the time to plan for a new roof! Call us today for a free consultation and estimate. Some roofing companies have told me that it’s not necessary to put tar paper on the entire roof deck. Is this true? If the pitch (slope) of your roof is less than 8/12 (30 degrees), it’s wise to use a protective moisture barrier, such as felt paper, on the entire surface of your roof. This will protect your roof from leaks during a severe, wind-driven rainstorm, which can force water between the shingle courses. Also, most manufacturers will not provide full warranties without a protective paper on the entire roof deck. If you are in doubt, please check with the manufacturer to make you aren’t missing out on your full warranty. What is an ice and water shield? Does it prevent ice damming? Ice and water shield is a rubber membrane that adheres to your roof deck. It creates a leak-proof barrier in critical areas, such as roof edges, in valleys, and around any protruding object on your roof. It will not prevent an ice dam from forming, but it will prevent water from entering your home in the areas where it’s applied. On some lower-slope roofs, we will recommend installing ice and water shield on the entire low slope deck. How many nails per shingle do you use? We always use 6 nails per shingle. It’s part of our commitment to quality and superior service. Yes. We are fully insured and licensed in the Niagara Region. We carry a 5 million dollar liability insurance policy that protects the homeowner from any financial responsibility resulting from personal injury or property damage during the course of the installation of a roofing system. In addition, we adhere to all rules mandated by the Ministry of Labour, and our employees are protected under all workplace safety and insurance programs. All of our roofing work is performed by our own employees, and meets the standards outlined in our policies and procedures. You can rest assured that you will receive the same high-quality job as the person that referred you! Should I put new shingles over top of old shingles? No. When you add another layer of shingles, you aren’t installing the new shingles on a flat surface. That causes a variance in temperature that cause the shingles to buckle and crack, causing them to fail prematurely. Layering shingles also risks losing full manufacturer warranty, and may prevent you from noticing or correcting any mold or rot damage. Won’t extra layers of shingles provide better insulation for my home? No. It will cause condensation between layers and create problems. I was thinking of putting in a skylight, but I heard that they leak quite a bit. Can they be installed so they will not leak at all? When you install a skylight, you’re basically installing a window on your roof. So, you’ll want to use a quality product with an unbeatable warranty. Velux is the leading manufacturer of skylights and roof windows, and produces the most reliable product available on the market. As an Authorized Dealer and Certified Installer of Velux products, we can guarantee a quality installation that will be free of leaks and other problems associated with skylights. Can I see houses that you have put new roof on? Of course! We encourage you to look at our past projects. Not only will this demonstrate the quality of work we put into every home we renovate, but it will help you to decide on a product and colour that adds curb appeal to you home. Which is better: vinyl or aluminum siding? Choosing between vinyl and aluminum siding comes down to preference. Both products perform extremely well in a variety of weather scenarios. However, if you have children who play ball or other sports in the driveway, we recommend vinyl siding. Aluminum siding will dent if struck with a hard object, whereas vinyl is far more flexible. Should I replace my skylight when I put a new roof on? If the skylight is more than 15 years old or is a builder’s grade product, we recommend replacing it. Our estimators are happy to help you determine what to change – feel free to ask any questions about products or installation! 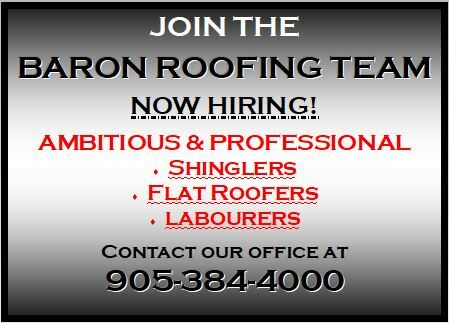 Is your roof more than 10 years old? Once your roof ages past 10 years, you may notice some of these signs of weathering or damage. If you do, it indicates that your roof needs repair. Extreme wind conditions and snow removal can damage your shingles. This may take the form of broken, torn, or missing shingles, which can create leaks and/or water damage. When roof decks warp, they create a visible distortion of the horizontal lines of shingles on the roof, going up the roof slope (buckling). Shingle tabs become exposed to wind and wear, leaving your roof at risk for water entering. Clawing takes place when a shingle’s bottom edge curls under the rest of the shingle. The remaining bulge is susceptible to substantial damage, such as wind, hail, or ice. Curling is similar to clawing, only the shingle tabs curl upward. It makes shingles highly susceptible to wind and ice damage. Do you have a question that you don’t see here? Contact Us to submit a question or call us at (905) 384-4000.